Welcome to Eric's Trains! My name is Eric Siegel and this is my 3-Rail O-Gauge/O-Scale train website. My train adventure started around 1990, when I was about 14 years old and inherited my father's old postwar Lionel set. The set had been in storage for many years in a dark and damp basement, so much of it was is pretty bad shape. However, with a little work, I was able to get the majority of the set back into operating condition. Additionally, I was able to add a large amount of new equipment to the set, resulting in decently sized 16'x8' layout. By the late 80's and early 90's, Lionel had been reduced to making stuff that really wasn't all that great and the selection of highly detailed scale trains was fairly limited. Although several innovations had been made during Lionel's MPC years, quality and detail was still a little lacking, as was selection. All the new pieces that I bought during this time were a bit flimsy and the plastic pieces broke very easily in the event of a train wreck or even under normal wear and tear. The low level of craftsmanship in the new trains was something of a disappointment, but what could I do? The internet as we know it today was not around yet, so finding Postwar trains was both time consuming and expensive. I was forced to make do with what was readily available. This low point for Lionel was truly a time when a father could say to his son, "They don't make 'em like they used to". But that would soon change. In 1994 I went off to college. My mother sold her house and I had to put the train back into storage in my father's basement. I took a great deal of care in packing it away, as I knew I would one day take it out again. Jump ahead to 2005. I graduated from UGA in 2000 and was living in a big loft apartment in downtown Atlanta and the arrival of my son prompted me to pull the set out and start the adventure all over again! I've since discovered that the new century has ushered in a new "golden age" for O-Gauge trains. In the early `90's, Lionel once again started to make quality products again. Additionally, serious competition entered the O-Gauge train scene and Lionel began to lose it's near monopoly of the O-Gauge train market as manufacturers like Atlas, MTH, Weaver and others brought a level of quality and realism to O-Gauge never seen before. Competition between the train makers has led to great leaps in technology and realism. Hooray for capitalism! Some of the new Lionel die-cast cars that I've recently acquired are even more beautiful than the original postwar versions! MTH and Atlas are making incredible trains and accessories that give Lionel a serious run for their money and even surpass Lionel in many areas. In addition to the return to quality construction, modern technology has taken over and completely revolutionized model railroading. 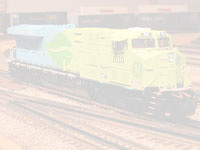 Computerized train systems, such as MTH's DCS system or Lionel's Legacy system, allow train enthusiasts to control the ENTIRE train set via a single hand-held remote control! With multiple companies now making high quality O-Gauge trains again and technology taking model railroading to new heights, it's a great time to get back into the hobby! Things have certainly changed from when I was a kid and with my son now getting into the hobby for himself I can say to him, "Son, they sure don't make 'em like they used to, and thank heavens for that!" The first new layout that I created in our old loft apartment was a modest 12x8 size. Soon after I started building the layout I decided to abandon the postwar style of train layout and go for a highly detailed scale layout. This meant shelving most of my smaller O-27 trains and purchasing new 1:48 scale pieces. I never completely finished the 12X8 layout because in late 2006 we bought our first house. Our house has a basement that's around 900 square feet (roughly 25x36) and it's 100% for the trains! You can keep up with the latest layout progress by following Eric's Triains on Facebook. My expected completion time for the new layout is now sometime in 2020, though that may change. Layouts are never really done, are they? My current layout, which I've named The Appalachian & Western Railroad, is an O-Scale layout which uses MTH's Digital Command System (DCS) as well Lionel's Legacy command sytem. The trains all run on Atlas O 3-rail track and I use a combination of Atlas and Ross switches. The layout is, and will continue to be, a modern themed scale pike. I did not grow up in the steam era, nor did I grow up in the streamlined diesel era. I grew up in the 80's and 90's when it was all modern diesel power. Just like anyone who grew up with steam or early diesels, I too have fond memories of the trains of my era. I can remember sitting in my parents' car at a crossing and watching with fascination as those big ugly diesels thundered by with a long stretch of battered and weathered freight cars. While I have a few diesels here and there that are from the 50's and 60's, the majority are 70's and later model diesels and rolling stock. Occasionally I will also run some older steam power and rolling stock just for fun, but the layout itself is modern themed. The roads that I try to concentrate on are the ones that are still around today and that I see around where I live: Union Pacific, CSX, Norfolk Southern and BNSF. I'm also getting into some of the older roads that have been merged into the previously mentioned roads, like Southern Pacific, Conrail, Santa Fe and the like, since it's still possible to see engines and rolling stock with the livery of those older roads on the rails today. Basically, anything that might be seen on the rails today is fair game. For more information on the current layout, check out this page. In addition to my large O-Scale layout, I also dabble in a couple other types of trains. I have a growing collection of O-Gauge and Standard Gauge tinplate trains like those made by Lionel, Ives and American Flyer in the early 20th century. I also have a small amount of On30(narrow gauge O-Scale) equipment and there is a small narrow gauge line in the mountains of the Colorado Room on my layout. If you'd like to keep up with my model railroading adventures, check out my YouTube Channel, Facebook Page, Train Blog or follow me on Twitter.